With Bakes Urethral Sounds, you will feel a greater sense of the sound traveling through your urethra than with any other urethral sound. From a tactile perspective, Bakes Sounds (also known as the Rose Bud Sound Set) provide the most spectacular sense of a sound traveling through the urethra of any urethral sound. This is due to the relatively small contact area that this sound has with the urethra. The Bakes Sounds are unique in the respect that only 3/4 to 1 1/4 inch of the sound actually dilates the urethra, which translates to a very small contact area within the urethra. The smaller the contact area as the sound travels through the urethra, the greater the stimulation. Each set of Bakes Sounds includes 9 sounds that are 12 inches long and range in size from 12fr (4mm) to 20fr (13mm). 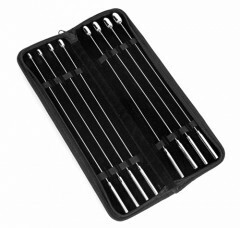 Each different type of urethral sound has it own unique tactile feel as it travels through your urethra. The Bakes Sounds have the smallest contact area of any of the urethral sounds, and tthe smaller the contact area, the more intense the stimulation. Now apply the above analogy to the sensation you can expect with a Bakes Sound over other sounds. Substitute the needle or tack in the above analogy for the top of a broom handle and you can now get a good idea for the difference in stimulation you will feel over other sounds. The Bakes Sounds will provide a greater sense of travel, and feel more like a ball bearing traveling through your urethra than a metal shaft (like any other urethral sound). The Bakes Sound Set is a must for anyone who enjoys sound play! If you are less experienced, don't worry. The Bakes Sound set comes with a great range of smaller sizes, and on the upper end, the sizes will be large enough to satisfy even the most intense sound players. Clean your Bakes Sounds with warm water and antibacterial dish soap, then wipe down with alcohol and allow to air dry before use. Remember to make sure that both your hands and the sound are very clean before starting sound play. The use of surgical gloves for sound play is also a great idea. Never use sounds on more than one person.